This is a divine dish of layered saffron rice and cooked chicken breasts bound together by seasoned yogurt and egg yolk mixture. We Iranians love our rice and love to layer it with different types of vegetables and meat. However, the most tasty and desired part of this dish is the bottom layer of the rice (tah-dig). ته چین Tah-chin is the tah-dig lovers galore! Since the rice is served upside down and cuts like a cake, you can have your rice cake with a thick tah-dig and eat it too! "Tah" is a Persian/Farsi word for bottom and "chin" is the root word for "chidan" which means putting things in order, arranging and in this case, layering. 2 1/2 cups long grain basmati rice, rinsed and soaked in water with 2 tablespoons of salt for a couple of hours. Drain. Place the raw chicken breasts in a pot along with onion, add turmeric, 1/2 teaspoon salt and a cup of water, bring to boil on medium-high heat, reduce heat, cover and cook for an hour on medium-low heat. Set aside to cool. Cut the chicken into small pieces. Bring 6 cups of water to a boil in a large pot on medium-high heat, add the rice and boil for about 8-10 minutes or until rice grains are soft on the ends and firm in the center. Drain and pour some cool water over it to wash away the starch and to separate the rice grains. This cool water rinse helps bring about a more fluffy rice. Set aside. In a large mixing bowl combine yogurt, yolks, salt and saffron. Mix well. Add the rice to the yogurt mixture, blend well. 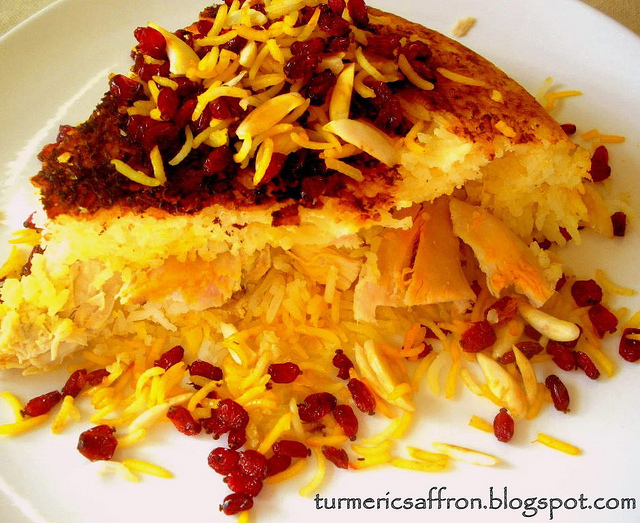 In a nonstick pan, add 3 tablespoons oil and a tablespoon of liquid saffron. Move the pan in a circular motion to cover the bottom uniformly. Ladle 2/3 of the rice into the pan, flatten with a wooden spoon, layer chicken pieces evenly and cover the entire surface. Pour the rest of the rice over the chicken pieces, flatten the top with the back of a large spoon while pressing down. Pour 2-3 tablespoons strained chicken stock, 2 tablespoons oil or melted butter and the remaining liquid saffron over the rice. Place the pot on medium-high heat. When you notice a steam coming up, lower the heat, cover and cook for one hour until the crust forms and the flavors come together. Since there's yogurt and egg yolk at the bottom of the pan it can easily burn, so adjust the heat setting of your stove accordingly. To serve this dish let it cool for a few minutes, this way the crust comes off easier. Place a round serving platter that is larger than the diameter of the pot. Hold firmly while wearing mittens, you don't want to burn your fingers! Then gently turn the pot over. Garnish as you like. 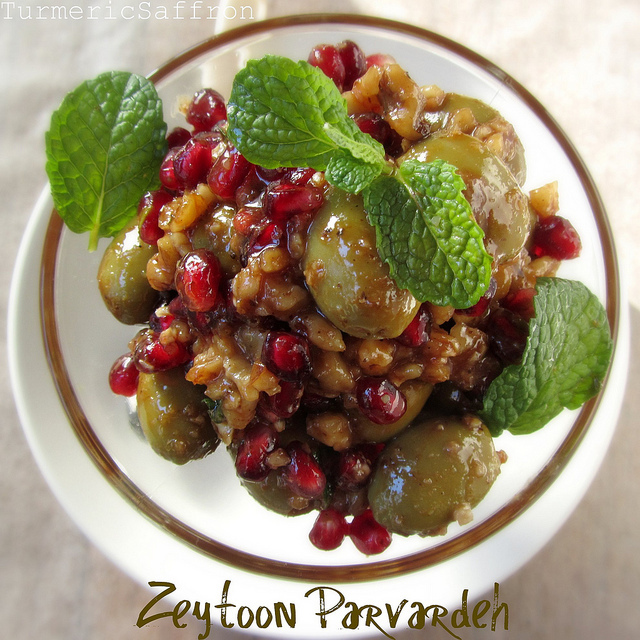 Tah-chin goes well with plain yogurt, mast o khiar, salad Shirazi, or torshi. Great! Give this one a try Bria, you'll like it. You can use grilled or fried eggplants as a meat substitute in this dish. That is an original dish! Really lovely! Rosa, Thank you for stopping by and commenting. This looks as beautiful as a dessert! What an uniquely beautiful dish. Fitri, He'll love it. That's a delicious surprise! Let me know how it turns out. Best wishes! Soma, Thank you. It looks like a dessert and cuts like a cake! I love rice, I can really eat this beautiful rice-chicken dish a lot. I used to make this dish quite a bit; to me it is a masterpiece of Persian cuisine! Beautiful photos too! I am giving away some goodies I got from Lebanon on my last trip, if interested! Thank you so much for trying this recipe. I'm glad it came out tasty and that your husband loved it! To answer your question, the tah-dig of this dish doesn't turn out as crunchy as the other regular rice tah-digs. The yogurt and egg mixture at the bottom prevents it from becoming the crunchy crust that love so much. However, there are a few things that would help. In my next post, I'm going to write about "ta-dig" and I'll explain it further. Thank you for your comments and your great question. Simply gorgeous and appetizing! Love the picture, I am totally salivating over here!! This dish looks so pretty and colourful, really would like to taste a wee bit! I am so impressed by your blog and your pictures. I am away from home since January but you describe and present your dishes with the same love as my mother does. Tomorrow I will try the zereshk polow. Hi! I hope you will read this before I start cooking, I have an urgent question: what happens if I have a pan that is higher than a skillet. I really don't have anything else :( Will it just fall apart when I turn the pan around? Nazanin: Hope it's not too late! Are you saying that your pan is too big? If that's the case, you need to hold the plate firmly so tahchin would come out in one piece. If you have a deep skillet with about 2 inches deep that should be o.k too. Please let me know how it turns out! best wishes. Thank you again for your thorough and maman-like description. Nazanin jan, I'm so happy that your first tahchin turned out well and everyone enjoyed it. Thanks for letting me know. Just a quick question. Is it possible to make this recipe in a rice cooker and if so how would I do that? Anonymous, Yes, just follow the same recipe but cook in a non-stick rice cooker, layer all the ingredients and follow your rice cooker's instructions for the cooking time. If you want a crispier crust cook it a bit longer. Thanks for visiting. Shayma joon,I use a non-stick pan and I cook this dish on the stove. Thank you for your kind words and have a wonderful week. 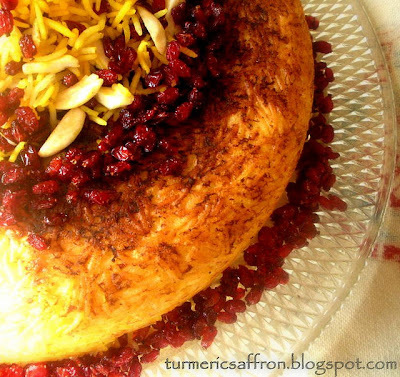 i have persian friends and im so happy to have found a persian food blog! i have my own blog at http://theremedycook.blogspot.com I am waiting for my friends to have a free weekend so I can go over and learn how to make Tah chin and kebab koobideh. thanks for blogging! Great dish, and an easy-to-follow recepie, thanks! Up to now I have mostly been eating persian food cooked by friends, time to learn to cook it myself;-) Can´t wait to try out more of your recepies. If you start with cooked chicken breast, then cook it an additional hour with the onion, doesn't it become very dry? You cook the chicken first and then cut into pieces. I have made the necessary corrections to the recipe. Salam Azita jan. I just wanted to take a moment to thank you. I am half-Persian and one of my new year's resolutions it to cook more Persian food. I made this meal this weekend and it was a hit! I've made several of your dishes and I'm so pleased by how close it is to my Grandmother's cooking, which I miss terribly since she's been back in Iran for the past few years. The flavors and aromas transported me to the days that I would watch over her shoulder in the kitchen. Your blog is inspiring to say the least. Thank you for sharing your story and these lovely recipes and photos! Rochelle jan, thank you for trying the recipes. I'm so glad you liked them!Thanks again! i have persian friends and im so excited to have found this blog so i can try and cook for them...when you say blend well with the yogurt mixture and the rice... do you mean just mixing it together or use a blender so it becomes smooth? thank you so much i can't wait to make this recipe! Rover92, yes, I mean just mixing it together. Thank you! I can't get over how wonderful your blog is! Thank you, thank you, thank you for all the time and effort you have put into making this treasure! This is the best guide I have ever come across for helping me make all the wonderful Persian dishes that I love and are so nostalgic to me! I love that I am now getting to share some of these with my children and husband. When I make them, I think of all my dear Persian friends that have touched my life. What a blessing! you are awesome Azita jan.....I AM ALWAYS LEARNING FROM YO!!! Outstanding, You are a Star ! HI, I love your blog, my husband is persian i'm mexican but loveee loveee persian food, i have a question can you make tah chin in a rice cooker? if so, how? thank you! Follow the above steps up to #5 and then arrange the layers of yogurt rice and chicken in a rice cooker. For cooking time follow instructions that come with your rice cooker. I don't have any non stick pans, but this all looks delicious! What should i do to prevent it from sticking? Bit more butter maybe? Severine, you can bake it in the oven in a well -buttered Pyrex dish. 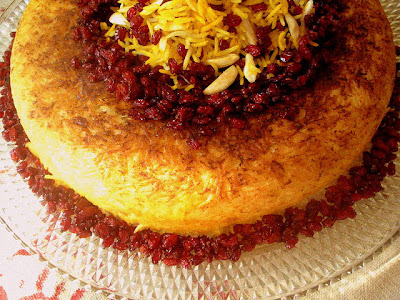 Can this dish be prepared in an electric Persian rice cooker? I love using mine as the tadig comes out perfectly! I have never made tahchin in a rice cooker but my guess is that it will work. Hi Nikki, strain the onions from the stock and use 2-3 tablespoons of the stock to pour over the rice. Yes, it's better to cover the lid with a towel and then cook the rice or bake covered with foil at 350 degrees Fahrenheit for 1 1/2 to 2 hours. This is lovely Azita! This is a staple in our household. I'm making it this morning for multicultural day. I also add Rose Water (2 tbl). Lovely fragrance. Yum! Dear Azita, Thanks for sharing your love of cooking with us all! Made your Tahchin last night & came out just like my late Mom used to make. I did add oil to the top of the of the rice once I finished layering all the ingredients. My husband who is not a yogurt lover went for seconds! Back to making your new recipe which you'd posted on FB. the heart shaped cream puffs....Yum! Hi Azita, Thank you for this beautiful recipe. Your Tahchin looks amazing and easy to follow the directions to prepare. I have a question: What is the best substitute for the yogurt you add to the egg yolks. My family is not allowed to mix meat or chicken with any dairy products. Please reply as soon as you can. I like to make this dish for the holidays. Thank you. Farahnaz, you can use non-dairy yogurt such soy yogurt or almond yogurt. Thank you and happy holidays! Hi, I have never made tah chin in a rice cooker. Thank you!